9065 Seth Thomas four bell Sonora Chime mantle clock. This clock has a red adamantine case with brass feet. The color of the adamantine has faded somewhat, perhaps from the clock sitting in a sunny window for a number of years. The adamantine is in pretty good condition but there are some quite small chips on the corner edges that have been colored in and they are not very noticeable. It has a signed silvered dial which does show a bit of wear from many cleanings. There is a heavy cast brass bezel with a convex beveled glass. It retains the original hands and pendulum. The rear cover board and label are replacements. This is an eight-day clock which plays Westminster chimes on the quarter hours on four resonant bells. It is presently running but I do not think the movement has been cleaned recently. 13 ½ inches tall, 15 inches wide. $225. 9066 Seth Thomas adamantine clock with serpentine top. This is one of the better models that Seth Thomas made in the adamantine line with the serpentine top, green marbleized rounded sides and four large marbleized columns. The case is quite clean and I do not see any chips or damages in the adamantine finish. It has the original signed dial paper which has yellowed a bit. It comes with the original hands, pendulum and a very good label. This is an eight-day clock with hourly strike on a gong and half-hour strike on a nickel bell. It is running. 9067 Seth Thomas red adamantine clock. 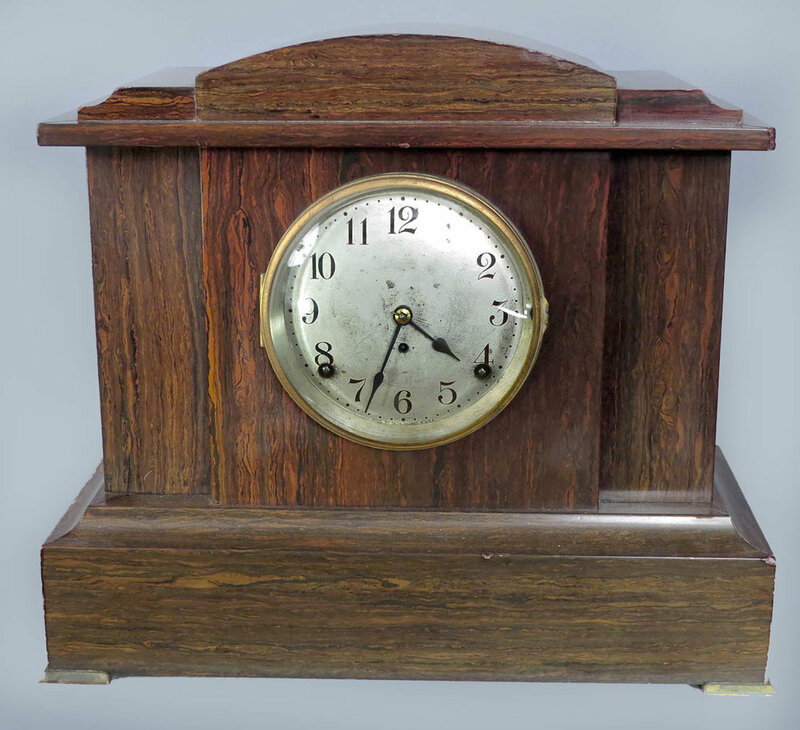 The case for this clock is in excellent condition with almost no wear or abrasions. The color is very strong and with a little bit of case cleaning it would look even better. There are six brass colored columns on the front with lion heads at the sides and brass colored feet. The signed paper dial is in excellent condition and the clock comes with the original hands, pendulum and key. This is an eight-day clock with hour and half-hour strike on a gong. It runs for me for a short while before stopping. The movement does not look like it has been cleaned recently. 11 ½ inches tall, 17 inches wide. $110. 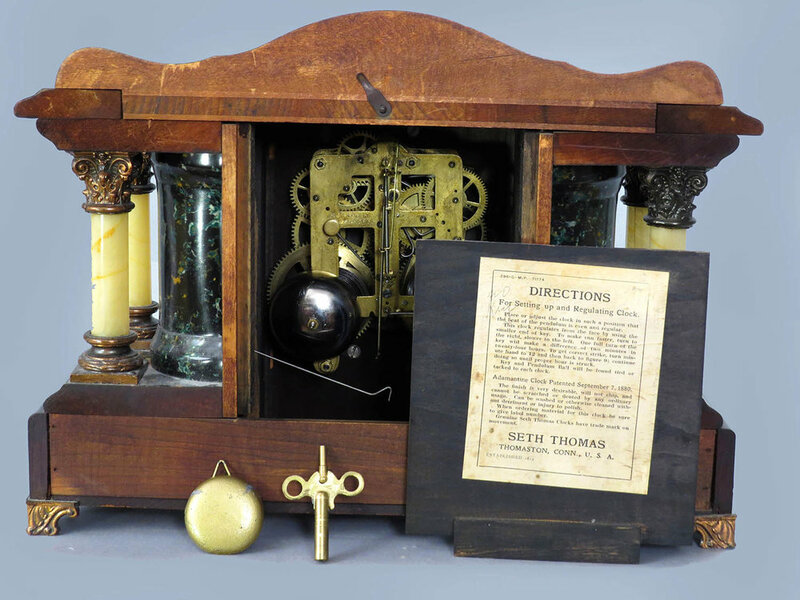 9068 Seth Thomas adamantine mantle clock. 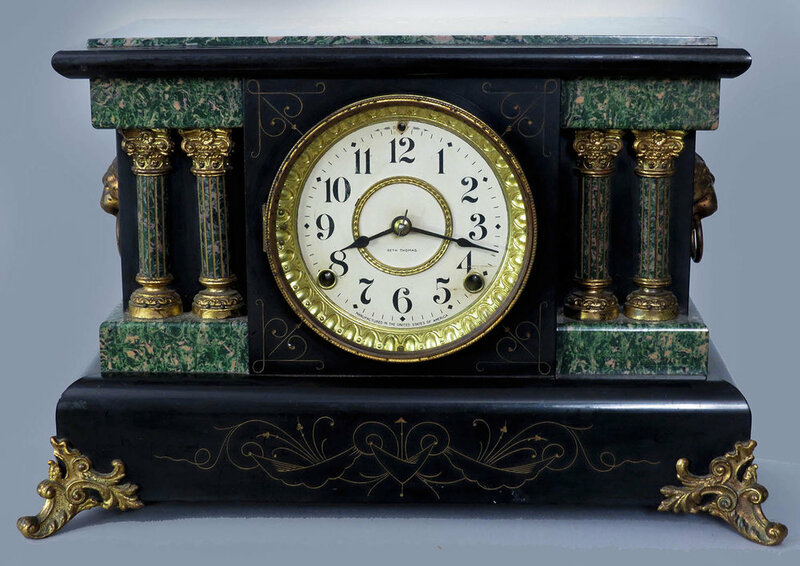 This clock has a nice clean case with black background and green marbleized trim, columns and top. I do not see any damages or abrasions in the adamantine finish. The original dial paper is in very good condition and the clock comes with the original hands, pendulum and key. It also has a very good label. This is an eight-day clock with hourly and half-hour strike on a gong. The movement is due for a cleaning and I see at least one bushing that is worn. 11 inches tall, 17 inches wide. $85. 9069 Sessions black mantle clock. 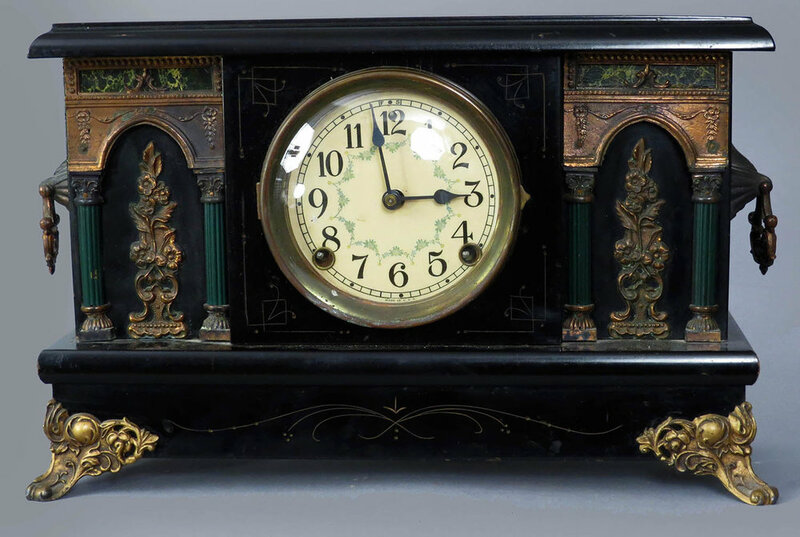 Typical of the style from the early 1900’s, this clock has a black painted case with marbleized trim, green metal columns and cast metal female figures and feet. The overall condition is quite good but a little case cleaning might be helpful. The signed paper dial is behind a brass mask, the center of which shows some greenish discoloration. It comes with the original hands, pendulum and key. 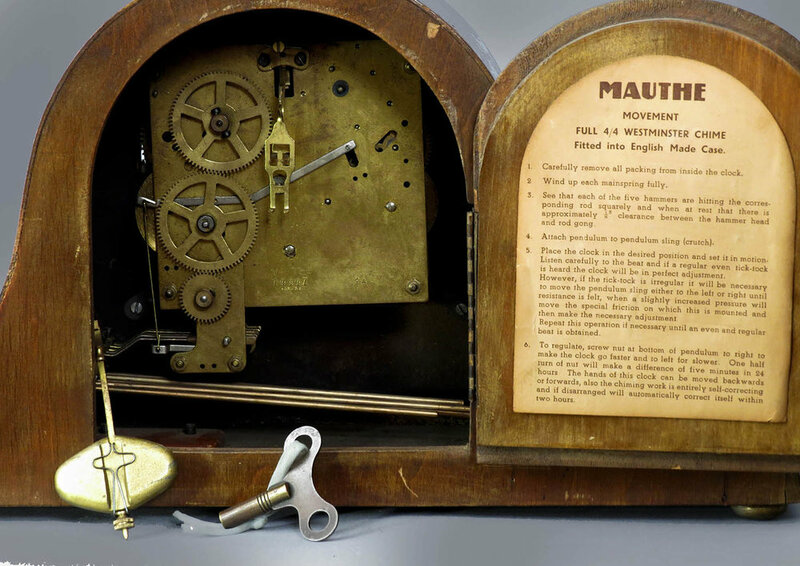 This is an eight-day clock with hourly strike on a gong and half-hour strike on a bell. It is running. 11 inches tall, 17 inches wide. $65. 9070 Seth Thomas adamantine mantle clock. 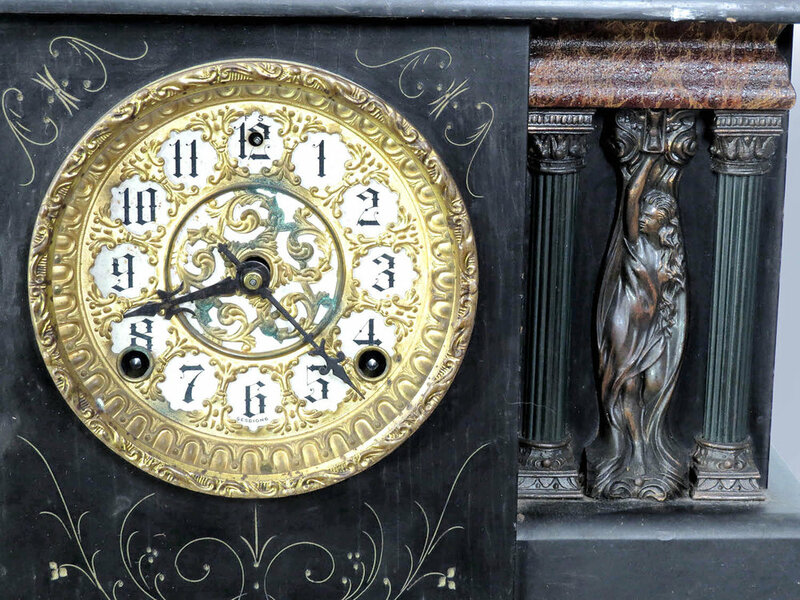 This clock has a black adamantine background with green marbleized trim and top, lion heads, cast metal feet and marbleized half columns. The overall condition is quite good and I do not see any damages or faults to the adamantine finish. This model has the more ornate cast brass bezel with beveled glass. The signed dial paper is the original but is showing a little bit of wear. It has the original hands, pendulum and key. This is an eight-day clock with hour and half-hour strike. The movement is probably due for cleaning and the “fast-slow” adjustment needs a small repair. 9071 Sessions black mantel clock. This is quite a nice clock with a clean black painted case plus cast metal feet, trim and side pieces. There are no significant case problems or issues. It has the original dial which is celluloid to resemble porcelain. The clock comes with the original hands, pendulum and key. There is a reasonably good label on the back. 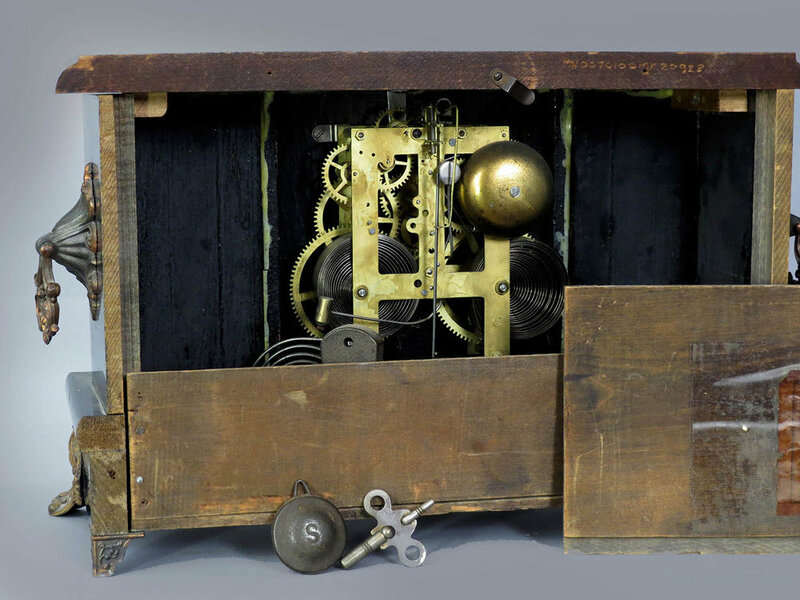 This is an eight-day clock with hourly strike on a gong and half hour strike on a bell. It is running. 10 inches tall, 16 inches wide. $65. This clock has a clean, refinished case which seems to be solid maple and there are no chips or damages. It has the original hands, pendulum and signed dial paper. There is also a good label plus directions paper on the back. This is an eight-day clock with hour and half-hour strike. It is running but someone did a poor repair in the past when they cut and soldered the rear plate to change the mainspring. 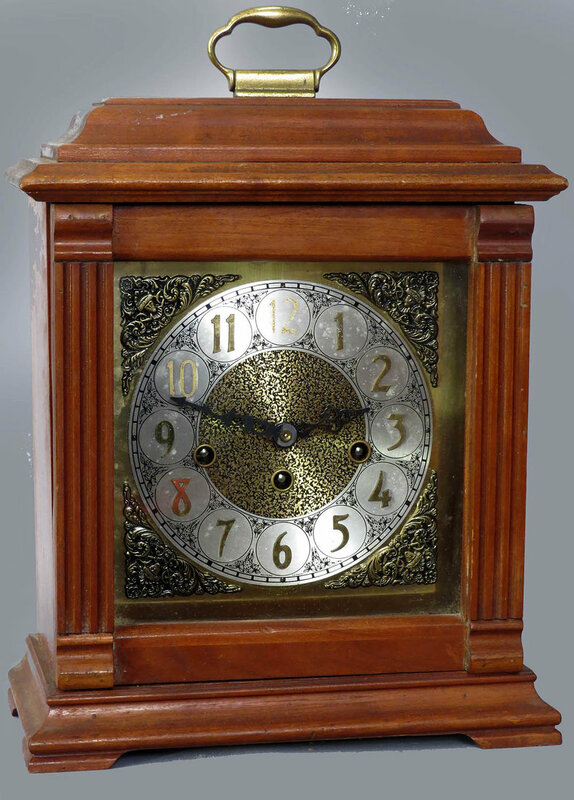 9073 Mauthe Westminster chime mantle clock. 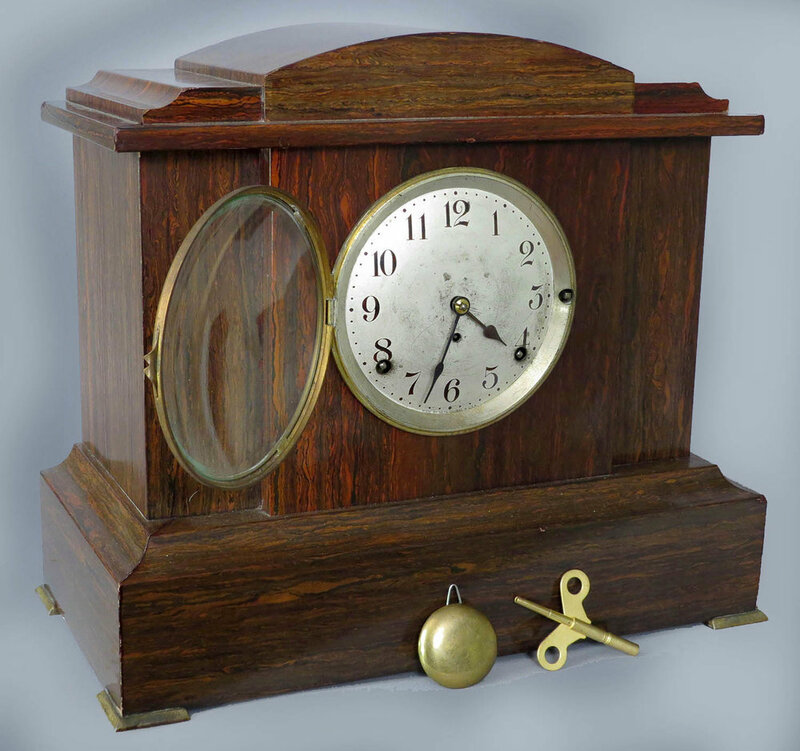 Made in England, this clock has an oak case which is in good condition with the original finish. There are no case damages or problems. It has a silvered bezel, dial ring and hands set against an oak center. The door glass is missing. It comes with a very good label plus distinctive, original pendulum and key. This eight-day clock strikes Westminster chimes on the quarter hour on 4 rods and strikes the hours on 3 rods. The movement will need cleaning to put the clock in good running order. 9 inches tall, 16 ½ inches wide. $65. 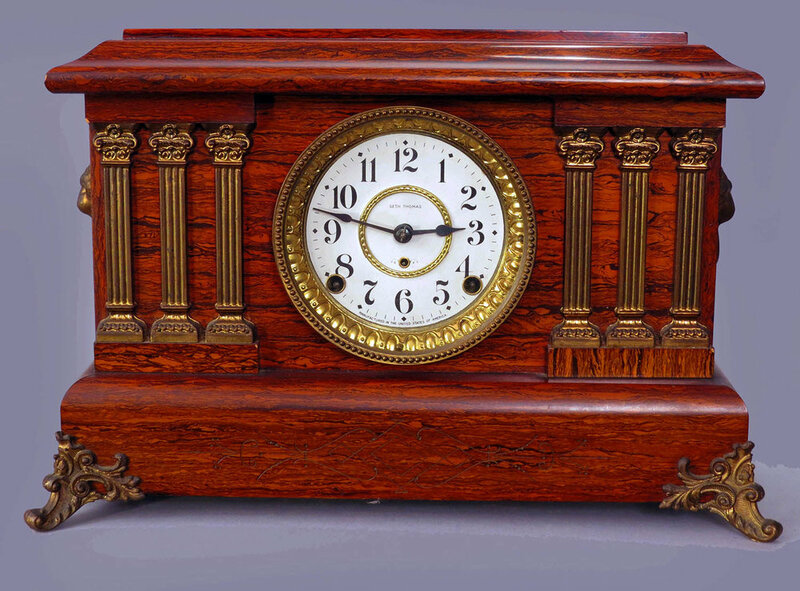 9074 Revere electric Westminster chime tambour mantel clock. This clock has a mahogany case which could use some cleaning but is otherwise fine. There are no case damages or chips. It has a signed silvered dial with brass hands and a brass bezel. 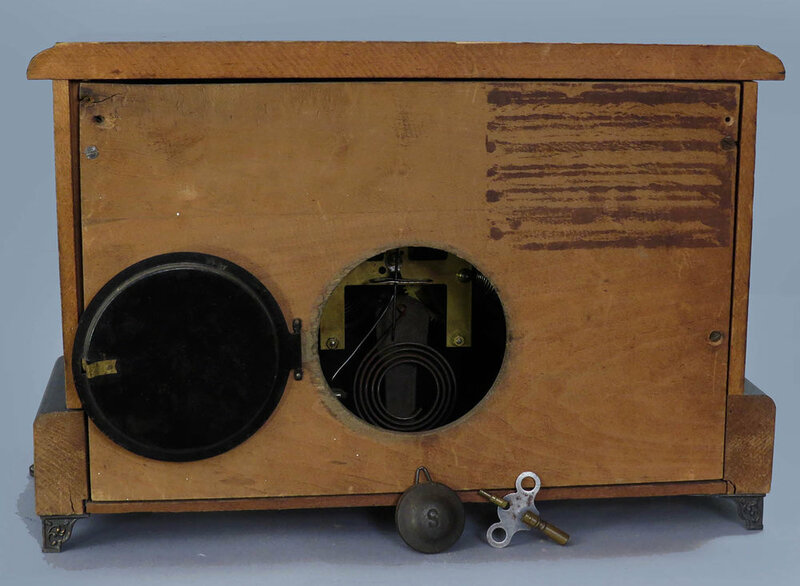 This clock uses a Telechron motor and probably dates from the 1930s. It plays Westminster chimes on each quarter hour on 4 rods. It is running but noisy and in need of lubrication. There is a good label with directions on the rear door. 7 inches tall, 16 inches wide. $45. 9075 Emperor Westminster chime mantel clock. This clock has a solid mahogany case which needs cleaning but is otherwise fine without any damages. It probably dates to the 1970s. It has a metal dial with applied numerals but notice that a couple of those numerals on the 10 and 12 are missing. This eight-day clock plays Westminster chimes on the quarter hours on 4 rods and strikes the hours on 3 rods. The movement is overdue for a cleaning. 15 inches tall with brass handle. $55.